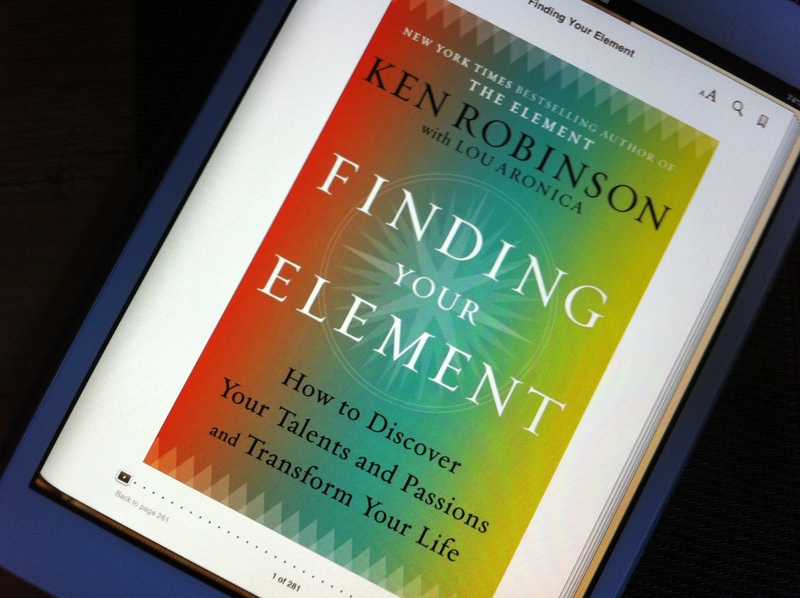 Sir Ken Robinson is back with a sequel and companion to The Element, read on for a full review. Disclaimer: I’m a Sir Ken Robinson fan. Since I shelved my scepticism in 2011, I’ve been enthusiastic in every respect. From the video marathon to the retrospective epiphany, and my final review of The Element, my take has been persistently positive – this post will be no different in that regard! And so my quest had begun. The first and most essential step taken without actually picking up Sir Ken Robinson’s The Element – my conversion to fan of the book and the man came later. Fast forward – what does Finding Your Element offer to would be readers? It offers the same motivational, relatable, balanced and hopeful package as The Element. It’s offered in the same humorous, easy to read prose – but this time it’s more personal. It’s about the reader and their personal quest and is full of exercises, suggestions and tools to help readers plan and commit to that essential first step. The stories of people inside seem more focused on every-day people and less focused on people who became rock star savants, though of course there is some of that. The book also contains a more robust conversation on how a person can have more than one Element, and how it can change over time. Besides the laughter and the motivation to continue my quest, the most useful thing for me inside Finding Your Element was the recognition that for most of us who are just starting to cultivate our Element, it takes sustained effort, which can feel like work. But it’s work you enjoy doing, it’s work you’d do even if you weren’t getting paid, and as you hone your raw “aptitude” into a bonafide “ability,” you enjoy the journey, you see your progress, you “get it,” and you continue to push forward hoping to achieve more regularly the nirvana of being in your Element. As I aspire to write a great Canadian novel, these messages are timely. It’s work, it takes time, but I do enjoy it; When I’m in the flow I do lose track of time, and I do believe my writing ability is getting better week by week. I’m doing it without getting paid, in-fact I’m actively investing in honing the “ability,” an investment that’s likely never to make a financial return. Yet, taking pleasure in getting better at something creative, productive, and moving towards spending a larger portion of my life immersed in that – I think it’s worth any price. Irony is everywhere. When I started my continuing education Fine Arts Diploma Program (FADP), and this blog, it was in a mini rebellion against the self help industry. The Element with its tagline “How finding your passion changes everything” was the major culprit that made me look down my nose at this entire section of books and enrol in FADP instead. Of course as you know from my review of The Element, which I wrote immediately after reading the book an entire year after my initial shun; I loved it. I stumbled upon another self help book that I devoured this weekend entitled The Happiness Project and I loved it too. This book is probably old news for anyone who is into these types of books but it resonated with me and I feel inclined to reflect on it and its implications for Exploring-Art.com, which in some light could be looked at as the brand for my own Happiness Project. The output of this rumination will be the subject of the next few rapid fire blog posts. I am splitting it up to keep the outpouring of ideas digestible. It is interesting that I had alluded to some change ideas brewing from Wordcamp Victoria and which now, post weekend read, have been significantly altered. First we will start with why I loved the The Happiness Project, then in later posts we will talk about what it means for me and our adventures exploring art. The author Gretchen Rubin bares her soul. She shares graphic details of her temper, her husband’s illness and also profound glimpses into her inner conflicts. It is really inspirational to see someone open themselves up to complete strangers in this very rare way. Her personal stories resonated with me so much because I found the material so relatable. I had struggled with these challenges and came to many of the same conclusions. Her advice was often it depends – your situation may be different, you may have different needs. All of our journeys are unique. The books is brimming with practical advice of little things you can incorporate into your own Happiness Project without having to travel to an Ashram. The Happiness Project was wonderful. If you’re at all interested in promoting happiness in yourself and thereby in others as well, go get this book! More coming soon on its implications for me and Exploring-Art.com.